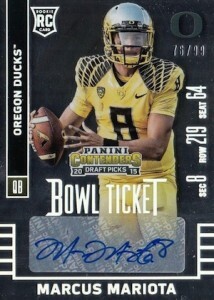 Rookie CardsFollowing a 2014 college season that saw Marcus Mariota compile an impressive list of accolades with Oregon, the collecting interest is building based on his NFL performance. 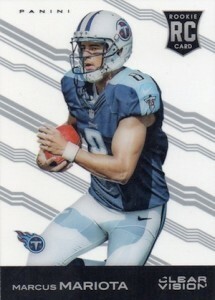 Now a member of the Tennessee Titans, there are several card options already available and plenty of Marcus Mariota rookie cards are on the way. After sitting out his first season as a redshirt freshman, Marcus Mariota took the helm at the University of Oregon and put forth three strong seasons. This all culminated with a junior year for the ages in 2014. Mariota was named the AP Player of the Year and won a string of other hardware, including the Davey O'Brien Award, Johnny Unitas Golden Arm Award, Walter Camp Award, Maxwell Award and finally the Hesiman Trophy. Not just about the individual awards, Mariota led the Oregon Ducks past the defending champion Florida State Seminoles and Jameis Winston in the Rose Bowl. However, he came up short in his quest for a title, losing to Ohio State University in the inaugural College Football Playoff National Championship. Marcus Mariota was considered a lock for the first round, but his stock surged leading up to the 2015 NFL Draft, eventually landing him second overall to the Tennessee Titans. Although his hobby recognition was already strong, this pushed things to another level. His veteran-like play with the Titans led to him being named the September Rookie of the Month and boosted his already-strong interest. Like previous seasons where quarterbacks were the top two selections, expect plenty of comparisons between Marcus Mariota and Jameis Winston. 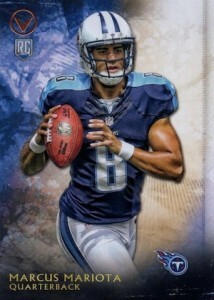 There are already quite a few official Marcus Mariota rookie cards available, with many more on the horizon. However, several of his early cards, notably his college-themed cards from Upper Deck and Panini, should see long-term interest. 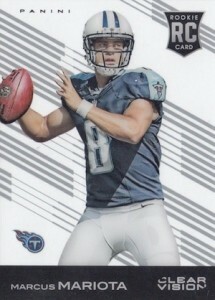 The following guide features all rookie cards for Mariota as well as his key pre-rookie and college-themed cards from 2015 products. The guide will be updated as more cards are released. 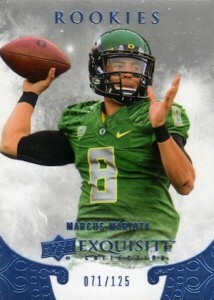 While long-term value will be minimal, the first Topps rookie card for Marcus Mariota comes from 2015 Bowman. The low-end base card features an airbrushed college image and has a generic feel. 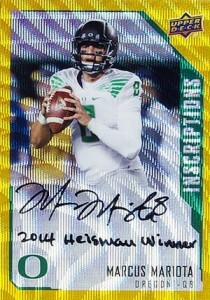 The more appealing options for Mariota come in the form of Chrome Refractors with on-card autographs. Featuring a retro design and familiar Rated Rookie subset, the rookie card for Marcus Mariota is an inexpensive way to start a collection. The value will never be high, but the card is a solid budget choice. The Refractor-like effect and large patch give the Panini Certified rookie card a distinct look. The sticker autograph is not ideal but the lower print run makes it a value option. 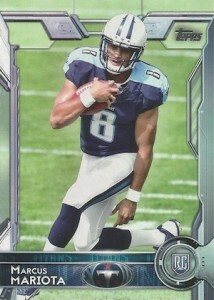 The first major release to include Mariota in his Tennessee Titans jersey, 2015 Panini Clear Vision is an acetate release. The appealing look and NFL jersey should result in lasting interest. There is also a short print variation that is shown on the right. Artistic with an added frame, Gridiron Kings is not the run-of-the-mill rookie card option and that is a good thing. 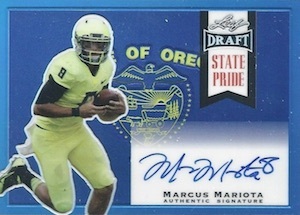 As an appealing rookie card, the painted look is distinct and there are also additional frame choices for Marcus Mariota collectors. 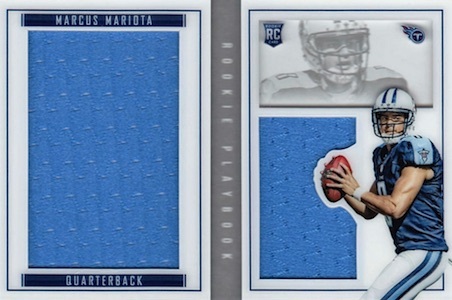 Two cards in one, the Playbook rookie for Marcus Mariota features both a large and medium jersey swatch and there is also a signed version. Both base versions are numbered to 199 and there are limited parallels as well. 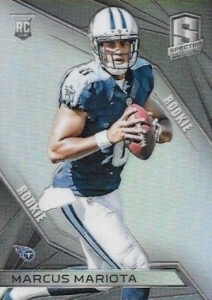 Although it was released after Clear Vision, 2015 Panini Prestige reverts back to the college image of Marcus Mariota for the base rookie cards. 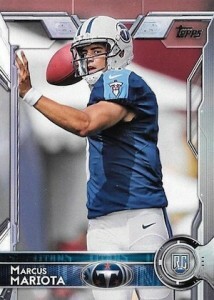 However, collectors can track down a short print variation with a Titans jersey. 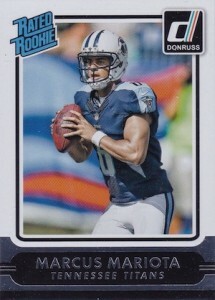 Limited to Target, the Rookies & Stars RC might not get as much recognition among Marcus Mariota collectors but it is available to wide group given where it is found. 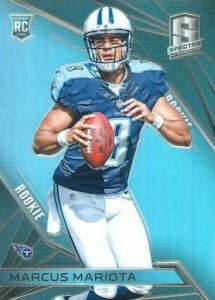 One of the more limited Marcus Mariota rookie cards, Spectra has three different cards, each numbered to 99. The two base cards are distinguished only based on the image differences. The autographed jersey card has a very similar look to the Certified card, but with a smaller patch and a little less busy design. 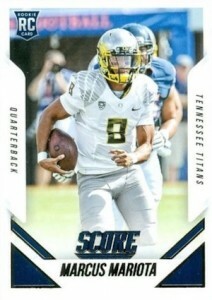 Simple and inexpensive, the 2015 Score rookie card for Marcus Mariota benefits from the college license acquired by Panini. Although the plain rookie card will never be worth much, it is makes for a much more appealing early rookie card option. 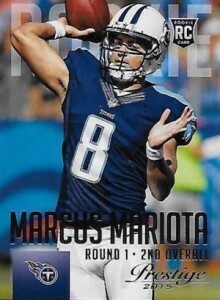 Another cheap choice for collectors, the flagship Topps product offers both a base rookie and short print variation for Marcus Mariota. While it is not part of the base set, many collectors still consider the Rookie Autographs insert to be an official rookie card. 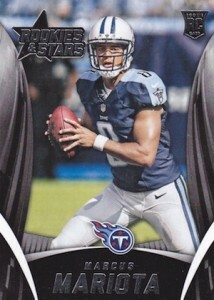 Mariota appears to be part of the short prints subjects as only parallels numbered to 50 or less have surfaced. There is also an image variation that is limited to ten copies. Despite being an earlier release, the Inception card commands continued interest thanks to the low print run, appealing design and on-card signature. While heavily altered backgrounds are not a new concept, and the design is actually quite similar to Inception, Valor continues its run as a solid budget rookie card for collectors. 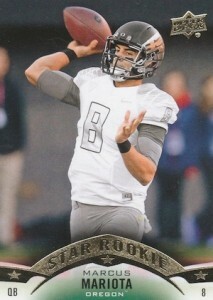 2015 Panini Father's Day #14- Marcus Mariota Rookie Card! PSA GEM MINT 10! 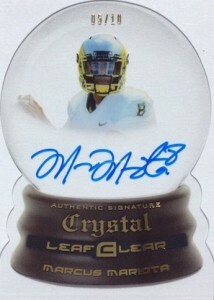 Although acetate is more common in the hobby these days, it is still a great option for displaying an autograph. 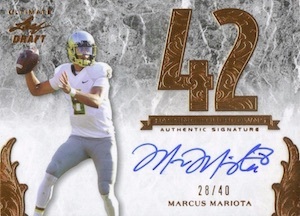 2015 Leaf Clear presents collectors with two Marcus Mariota autograph designs on acetate stock, each with a base Bronze versions as well as several additional foil parallels. The Crystal Die-Cut is particularly intriguing given the design based on a crystal ball. If acetate is your preference, but you don't need a signature, 2015 Leaf Draft Acetate is a factory set featuring several top names from the 2015 NFL Draft. 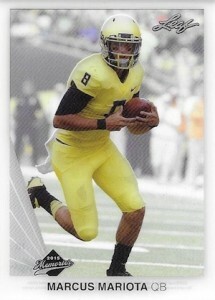 Marcus Mariota is one of the top names in the ten-card set. 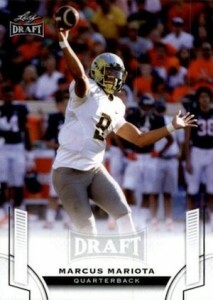 If you are looking for a base Marcus Mariota rookie with little flash or cost, 2015 Leaf Draft is a solid early option. The simple product is a retail release that includes base cards as well as autograph parallels. Marietta has five base cards and each has gold parallels and printing plates. There are also five signed versions, each designated "Mega Short Print" by Leaf. 2015 Leaf Metal Draft is an all-autograph release that features six different autograph designs for Marcus Mariota. On-card autographs and a variety of Prismatic parallels present collectors with plenty of choices. The base versions are silver and all of the colored parallels are numbered to 50 or less. 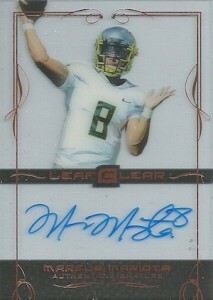 Just like the other Leaf releases, 2015 Leaf Trinity has several autographs for Marcus Mariota and most collectors view them as the best overall option among the group. Patch Autographs are the top insert and feature a large jersey piece and on-card signature. 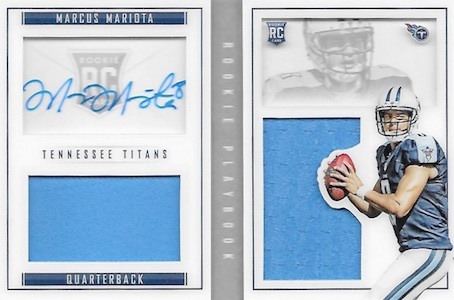 Additionally, Pure Autographs offer an acetate deign and Inscriptions Autographs include a large signing area and additional note from Mariota. Each autograph is available in an unnumbered base version along with several foil parallels of increasing rarity. Featuring a similar look to the Exquisite Collection card above, 2015 Leaf Ultimate Draft has a premium feel thanks to the ornate foil. 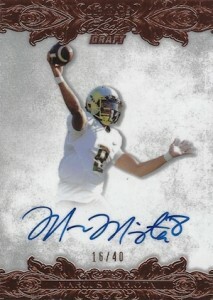 The base autograph features bronze foil and is numbered to 40, while the remaining Marcus Mariota cards are less common and feature different foil colors. There is also a Ultimate Numbers Autograph that pays homage to the number of passing touchdowns thrown by Mariotta at Oregon. Again, the base bronze foil version is limited to 40 and there are several other foil parallels that are more rare. 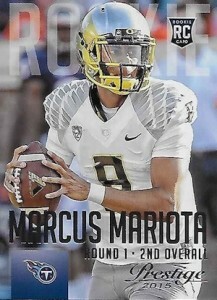 Possibly the top overall pre-rookie card for Marcus Mariota, Panini combines the storied Contenders Rookie Ticket line with a college twist to offer an early Marcus Mariota card. 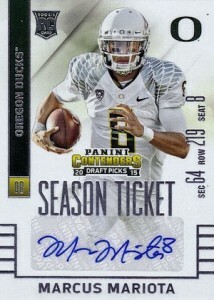 Featuring a sticker signature and a variety of parallels, there are actually two versions for Mariota in 2015 Panini Contenders Draft Picks. The base version, shown on the left, includes a white Oregon jersey and #8 in the SEAT section, while the variation on right features a yellow Oregon jersey and #8 in the SEC section. Panini revealed that the base version is a short print (SP - 250 copies or less) and the variation is a super short print (SSP - 50 copies or less). The second college-themed product from Panini, 2015 Prizm Draft incorporates the familiar brand into a NCCA set. 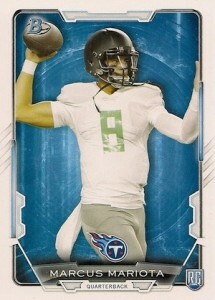 Collectors can find the best values for Marcus Mariota with the limited Prizm parallels that feature many colors. 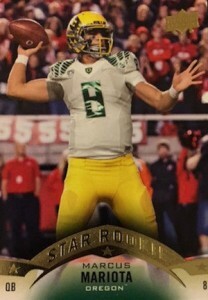 A popular early release for football collectors, the base card for Marcus Mariota in 2015 Upper Deck is part of the Star Rookie subset. 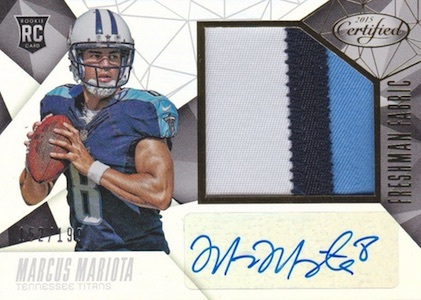 Mariota also has a retail-exclusive variation that is a short print. While the strong action images and familiar design usually make UD an appealing non-NFL option, the college releases from Panini will likely hurt long-term interest. 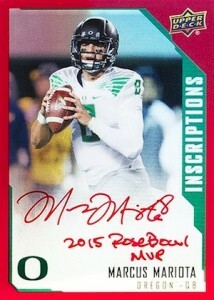 A new all-autograph product from Upper Deck, 2015 UD Inscriptions is making early waves with collectors and Marcus Mariota is a huge reason why. The simple release includes just one basic autograph design and four different versions for each player. For Marcus Mariota, this includes a base silver autograph, red parallel (#/49), black parallel (#/25), and gold parallel (#/10). In addition to the different colors, each parallel version features a different inscription. Part of a late-2014 release from Upper Deck, the 2015 Draft Picks are covered in a limited insert. 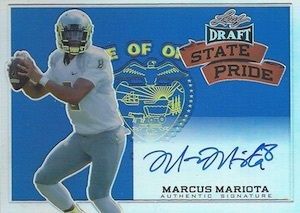 While previous editions were signed, the Marcus Mariota card should remain popular with collectors even when his NFL rookie cards are released. Was looking at the stats on the back of the Mariota bowman rookie, and under team it says Buckeyes. Obviously it should say Ducks so is this an error and was it ever corrected? To my knowledge, it was never corrected.